1) It's MONDAY, OCTOBER 15. Football's here and that means it's the perfect time to delight the Dolfans in your life with our 'Fins At 50' book. Check it out here on Amazon. 3) In The Previous Blogpost (ITPB): Hurricanes at Virginia with CSM poll, rest of state Collball, your Heat/Butler trade verdict & more. 3) Join us on Twitter @gregcote. Also Facebook and Instagram. Latest CSM results in: Voting is complete in the latest Canesfan Satisfaction Meter poll following Saturday's 16-13 loss at Virginia. Find it in the previous blogpost or directly here. Our most recent columns: No More Excuses, Florida Panthers and Tannehill: Requiem For A Quarterback. Also: Kid QB Passes His Big Test, Whatever Happened to Kenyan Drake? and With All D.Wade Has Meant, One Year to Say Goodbye Might Not Be Enough. DOLFAN SATISFACTION METER: G6: 75.0%: Results are certified in the latest Dolfan Satisfaction Meter postgame poll, and they show 75.0 percent overall approval -- the combination of "very" and "somewhat" satisfied votes -- in the wake of Sunday's 31-28 overtime home victory over Chicago putting Miami's season record 4-2. The DSM is a continuous weekly gauge of how Dolfans are feeling about the team and its direction. Right after each game I invite you to share your overall degree of satisfaction. Criteria for voting is your own, but I suggest fans consider the most recent game's performance and caliber of opponent, season as a whole, direction the club is heading and your overall degree of optimism -- all in the context of reasonable expectations. Results are certified official the morning after one full day of voting. In this case that was around 8 today/Tuesday. (The DSM also takes place on our Twitter site @gregcote. The vote there was 67% approval). Next poll: Oct. 21 following game vs. Detroit. G6: CHICAGO AT DOLPHINS: BOUNCEBACK BY FINS DOUBLY TRICKY WITH TANNEHILL OUT: Postgame thoughts: The Dolphins' 31-28 overtime home win over favored Chicago today had to be one of the better regular season shows in franchise history. Ryan Tannehill sat out inactive with a shoulder injury. Miami should have had no chance against a vaunted Bears defense. But the Fins, down 21-10 deep ino the third quarterback, kept fighting back, kept answering. There were heroes everywhere. Brock Osweiler passed for 380 yards and three TDs. Albert Wilson had 155 yards receiving and two scores. Frank Gore rushed for 101 yards. The depleted O-line erased Khalil Mack and gave up zero sacks. But it allwould have zeroed in on Kenyan Drake's goalline lost fumble in OT had Miami not won on a last second 47-yard field goal. What an exhilarating win for a Dolphins team that overcame consecutive bad losses and is now 4-2 on the year ..... Halftime thoughts: With QB Ryan Tannehill unexpectedly inactive with a shoulder injury, Brock Osweiler has done well: 12-for-19 for 114 yards and a 5-yard TD pass to Nick O'Leary. Only a later interception has smudged his day so far. Meanwhile two big defensive plays -- a Reshad Jones fourth-down stop and a Kiko Alonso goalline fumble -- have preserved the shutout. This would be a significant upset. But can Miami close the deal? ..... Original post: Miami coach Adam Gase has a brief history with the Bears, having served one year as their offensive coordinator in 2015, in between his time in Denver and his coming to the Dolphins. His relationship with Jay Cutler that year led to Cutler's ill-fated signing by the Dolphins last season. Alas, I don't see Gase getting much more from the Bears on Sunday. Chicago is 3-1 and coming off a bye as a 3-point favorite entering Sunday's 1 p.m. game here. Miami is 3-2 and coming off consecutive awful road losses. It's the right time for a home game for Miami. But the wrong opponent. Our NFL predictions get from conception to delivery in myriad ways. Here, the gut feeling out the gate was to go with Miami — one of seven home ‘dogs in Week 6 — in a pretty big upset. The gut is usually enough. I’m a bit superstitious about thinking one thing and then changing my mind. But I did on this. Yes, the Dolphins (2-0 at home) have a reasonable upset shot, although I’d feel better about that if I was sure left tackle Laremy Tunsil (concussion protocol) would play. I mean, Bears sackstar Khalil Mack will wreak havoc regardless, but the likelihood of a Ryan Tannehill nightmare spikes sharply without Tunsil. This game arrives as a rare treat; it is only these teams’ fifth meeting since 2002 realignment, and also carries the faint echo of the famous 1985 meeting at the Orange Bowl, when the Bears were 12-0 but Miami won 38-24 to protect the Perfect '72 Fins' place in history. Alas, this meeting finds Miami coming off two straight dispiriting losses in Foxborough and in Cincy while hot Chicago is percolating on both sides of the ball. That’s why the betting line opened dead-even but moved strongly as money poured onto the Bears. Tannehill must outperform (not to mention outscore) Mitch Trubisky, but that’s a bigger ask of Tanny versus a Bears defense I’d judge among the league’s top three. For a Dolphins squad trying to heal from consecutive road meltdowns, this home game is well-timed. If only this opponent were as well. My pick: Bears, 23-16. Visit Week 6 Gems for all of our latest NFL picks. Explainer: There was some confusion on two of my picks this week. I had Vikings winning and covering Sunday vs. Cardinals. I had Texans beating Bills, but Bills covering. 1. HEAT: Butler deal dead (for now) as season tips off in 2 days: Preseason? Done. Jimmy Butler trade? On life support. Regular season? Upon us. Miami's 31st NBA season tips off with road games Wednesday and Thursday at Orlando and Washington, and then the home opener on Saturday vs. Charlotte. The season will be about Dwyane Wade's "last dance" with Miami. It might have co-starred Jimmy Butler, but it appears that would-be trade has left the building. 2. DOLPHINS: Miami beats Bears in overtime thriller: Consecutive awful road losses -- 38-7 in Foxboro and then a blown 17-point lead in Cincinnati -- had the Dolphins hoping for some home healing Sunday vs. Chicago, and finding it in a 31-28 OT triumph. Ryan Tannehill sat out unexpectedly with a shoulder injury. Didn't matter. Brock Osweiler, the Wizard of Os, threw for 380 yards. 3. HURRICANES: UM loses at Virginia as benched Perry fails in first road start: Miami was No. 16 and 5-1 entering Charlottesville Saturday night but a mere 6 1/2-point favorite over the 3-2 Cavaliers in N'Kosi Perry's first career road start. We saw why. Perry stunk, Miami lost 16-13 and it appears Mark Richt is a man without a quarterback. 4. PANTHERS: Cats' launch 25th home season with losses: Florida fell down by two goals early only to fight for a 4-3 lead and then lose 5-4 to the Columbus Blue Jackets in Thursday night's home opener. Worse: Cats have played three games in the young season and are yet to win. Way too desperate way too soon is where this team finds itself. 5. MLB: NL, AL championship series underway: The Brewers and Dodgers are two games into their NLCS and tied 1-1 while the Red Sox pulled even with the Astros in their ALCS Game 2 Sunday night. Milwaukee, having never won a title in 50 seasons, is your Cinderella-designate of the final four. Amazing Christian Yelich had the season he did in those glass slippers. 6. MARLINS: Fish boot half of coaching staff after last-place finish: The Marlins fired four from their coaching staff including their pitching coach and popular longtime infield guru Perry Hill. Yeah, that'll solve it. It wasn't the massive payroll dump that caused the losing. It was coaching! 7. GATORS: Florida escapes Vanderbilt: The Gators trailed much of the game Saturday but a big second half carried UF, 37-27. 9. FIU: Rally, late stop lift Panthers: FIU beat Middle Tennessee State with an 11-point fourth quarter rally on then an end-zone interception in final minute. Nice win for the ButchCats. 10. MMA: Controversy throughout sport! : Scandal in the wake of the Conor McGrgeor fight and now controversy in Bellator, too. Or, did that go without saying? Missing the HB10 cut: Update. Countdown now 2,808 days (give or take) until Miami hosts its first match in the 2026 World Cup. 1) It is MONDAY, JULY 11. In The Previous Blogpost (ITPB): Wade-leaving aftershocks including build-a-statue and who's-now-face-of-Miami-sports polls, your verdict of booing Wade, LeBatard Show podcast dominance & more. 2) Join us on Twitter @gregcote. Also Facebook, Instagram, Vine, Periscope and Snapchat. MY DWYANE WADE COMMEMORATIVE SPECIAL-SECTION COLUMN: Click on Mission Accomplished, Legacy Secure for Sunday''s farewell-Dwyane column. Six-pack: Six select recent columns, ICYMI or thought them so wonderful they deserved another look: The Ending Was Ugly But the Run Was Sublime, on the stunning departure of Dwyane Wade. Heat Must Kiss-and-Make Up With Wade Now, warning of the imperative to sign Wade once the Durant dream was over. These Marlins Deserve Support Despite the Owner, and that tagline says it all. Ali Legacy Should Include Other Athletes' Thanks, on Ali setting template for sports. A Baseball Odyssey Finds Its Mountaintop, on local kid Richard Bleier's long climb to Yankees. Nobody Wins When a 55-Year Marriage Ends In Divorce, on PGA Tour leaving Doral. 1. HEAT: Stunner! Wade leaves Heat for Chicago Bulls: After 13 seasons and three championships, Dwyane Wade is gone. Just like that. Gone in free agency to his hometown Chicago Bulls while his adopted city reels over the loss. He was D-Wade. This was Wade County. It still doesn't seem real. This would be numbers one through eight in our Hot Button, or maybe the whole Top 10, based on the proportional impact in our market. Across the NBA, only Kevin Durant choosing Golden State was a bigger free-agency story than Wade leaving Miami. Farewell, Dwyane. The ending may have been ugly, but the run was sublime. Thank you. 2. MARLINS: Four Fish to All-Star Game, Stanton to Derby at midsummer break: Marlins wrapped up first half of season Sunday strong in playoff contention after a third straight win, and send four players (Jose Fernandez, Marcell Ozuna, A.J. Ramos, Fernando Rodney) to Tuesday's All-Star Game in San Diego. And Giancarlo Stanton will be in tonight's/Monday's Home Run Derby. Nice. 3. TENNIS: Wimbledon fortnight ends with perfect championship weekend: Wimbledon wrapped up Sunday with Brit Andy Murray winning the men's title after Serena Williams reigned with a record-tying 22nd major win. The perfect weekend for Wimbledon. 4. SOCCER: Host France falls to Portugal in Euro '16 finale: It was Portugal upsetting host 'France 1-0 in overtime Sunday afternoon in the Euro '16 championship match. After all the host nation had been through, including the Paris terrorist attacks, unless you were living in downtown Lisbon, you were probably hoping, "Vive la France!" 5. DOLPHINS: Club refutes speculation on construction delays: Crazy reports and rumors pinballing around suggested that Dolphin stadium renovation delays might force the Fins to play early-season home games Orlando. Wrong! Or so said the team, claiming all construction including the new canopy would be done by Sept. 1. Hmm. We'll see. 6. MMA: Depleted UFC 200 marks milestone for sport: UFC 200 went on as scheduled in Las Vegas Saturday despite the doping-related absence of Jon "Bones" Jones after the earlier withdrawal of Conor McGregor. Disappointed pay-per-viewers buyers, there's probably a class-action suit near you. 7. GOLF: Season's third major, British Open, begins this week: Jason Day, Dustin Johnson, Rory McIlroy and Jordan Spieth are bunched as favorites to win the 145th British Open commencing Thursday at Scotland's Royal Troon. Bonus fact: A "troon," according urbandictionary.com, is "a girl that looks like she used to be a man." Hey, don't blame me. I'm just the messenger. 8. ESPN: Network's ESPY Awards air this week: The ESPYs air on Wednesday night. Because ESPN doesn't get enough attention. And because there are not nearly enough awards shows. 9. OLYMPICS: Embattled Rio Games now less than month away: With the Aug. 5 Opening ceremony fast approaching, the Rio Olympics look to be in great shape other than the minor matters of the Zika virus, unfinished facilities, bacteria-riddled water, athlete withdrawals, doping suspensions, body parts washing ashore and local police saying they cannot protect visitors from rampant crime. 10. NBA: Summer league pivots from Orlando to Vegas: The Heat bounced to a 3-0 start in NBA summer league play, which features mostly rookies and undrafted free agents. So Miami missed out on Kevin Durant and lost Dwyane Wade, but otherwise -- a good week! Missing the HB10 cut: Chris Bosh "broke his silence" on Bill Simmons' new show but was not asked -- not once -- about his health. It'd be like having Trump as a guest and the presidential race is never discussed. You can't make this s--- up, folks ..... Panthers GM Tom Rowe and star defenseman Aaron Ekblad were touting Cats' Stanley Cup chances at a press conference. Love the confidence but, for now, less talking, more doing, please ..... Miami super-agent Drew Rosenhaus helped saved the life of an accident victim by offering roadside assistance. No word yet whether Rosenhaus waived his 5 percent fee ..... Seven MLS teams and only the Fort Lauderdale Strikers of second-tier NASL are alive in the U.S. Open Cup quarterfinals. Strikers play at Chicago Fire July 20 ..... We ride FIU and AD Pete Garcia pretty hard, so, in fairness, today we note that FIU's athletic department is having its best academic year on record including a highest-ever overall grade point average of 3.1. So there! ..... You know the Dolphins are in deep offseason hibernation when I get a press-release from the club touting an upcoming third annual "Mom's Clinic," evidently geared to females who are football fans but requiring a tutorial ..... Break the ice at a party with this one: "Did you know it is 133 days until the NASCAR season finale at Homestead?!" You're welcome ..... The Tour de France continues, despite a spate of bicycle tires being punctured by strewn steroid needles ..... Somebody check to make sure Johnny Manziel is OK. It's been almost a week since he last was embroiled in an embarrassing calamity. Poll result: It's "yes" on a Dwyane Wade statue: We asked if the Miami Heat should erect a statue of departed star Wade in front of the arena, and it was 64.1 percent yes, 29.8% no and 6.1% undecided. Poll result: Post-Wade, Marlins' Stanton is face of South Florida pro sports: We asked what current athlete is now the face of South Florida pro sports, and Giancarlo Stanton (pictured) led with 28.2 percent, followed by his Marlins teammate Jose Fernandez with 23.3% and Dolphins QB Ryan Tannehill with 16.3%. Chris Bosh (6.7%) will have to earn back his status, while Hassan Whiteside (5.9%) must prove himself worthy. Interestingly, 14.1% voted "someone else" not listed in the poll. If you were thinking Justise Winslow or Jarvis Landry, sorry, they're not there yet. 1) It is THURSDAY, FEBRUARY 25. New blogpost coming soon! 2) Thanks to our latest wave of Twitter followers. I must say LeBatard Show Tuesdays are good for business. 3) In The Previous Blogpost (ITPB): Hot Button Top 10, concern-level on Bosh verdict & more. 4) Join us on Twitter @gregcote. Also on Facebook, Instagram, Vine and Periscope. QUESTION: IS INADVERTENTLY FINDING ONESELF ON GRONK'S PARTY SHIP A GOOD THING? : So overgrown frat-boy (and, time permitting, Patriots tight end) Rob Gronkowski, his family, friends and paying guests take a three-day Caribbean cruise out of Miami, aboard the Norwegian Pearl. Much drinking and debauchery ensues, as you'd expect. Anyway, there were about 700 on board for the Gronk party ship (see representative photo), among a total cruise-ship population of around 2,300. In other words, roughly two-thirds of those on board were tourists who had no idea what they were getting in for. Maybe some liked it. But we already have heard others have complained to Norwegian about being blindsided into being an unwitting party to all the Gronkness and ensuing silliness -- somewhat the antithesis of the relaxation many expect from a cruise. So I'm curious. Say you and the family were aboard the Pearl for your Caribbean cruise only to unexpectedly learn the ship's predominant client was a massive Gronk party. Good thing? Or bad thing? Feeling lucky? Or a bit annoyed. Take a dip in our poll. What comes closest to how you'd feel to learn unexpectedly once aboard that your Bahamas cruise was a part of the Gronk Party Ship? FAITH IN MARLINS ALWAYS A CHALLENGE, BUT 2016 LOOKS PROMISING: Spent Monday up in Jupiter as the Marlins prepared for today's first full-squad work of spring. Click on Looking Up for the column in full. Here is a condensed version with my list of Ifs that must align if the Marlins are to surprise the analysts and bettors to become a playoff challenger: If Don Mattingly turns out to be an inspired hire, the anti-Ozzie Guillen, who used to leave the practice field to watch bull fights in his office, failed spectacularly and, as the perfect Miami parting shot, praised Fidel Castro... If a healthy Giancarlo Stanton is bearing in on 50 home runs as the pennant races heat, his at-bats perhaps the most exciting minute in sports... If a healthy Jose Fernandez (pictured) is in the heart of the Cy Young conversation, his starts turned into events that fill Marlins Park... If Dee Gordon prove his spectacular 2015 was no fluke, and if Christian Yelich begins to make the move from potential star to budding superstar... If Barry Bonds seizes this chance to rebuild his steroids-dented image and enjoys great impact as the hitting coach. (Quick memo to the Marlins: Do you think giving Bonds a late-season at-bat or two as a pinch-hitter would get any attention? You’re welcome!)... If Miami is cheering Ichiro’s 3,000th major-league hit as it cheers a playoff chase... If Marcell Ozuna re-establishes himself with a comeback year, and if big farmboy Justin Bour blossoms into the team’s biggest slugger not named Stanton... And here’s a personal if, if I may: If Jeffrey Loria and David Samson would force themselves to keep a much lower profile, Marlins fans would be a happier bunch... All of that would leave one more if, maybe the biggest of all along with the health of Stanton and Fernandez: If Miami sees the emergence of two more starting pitchers to join the ace Fernandez, newly acquired Wei-Yin Chen and reliable innings-eater Tom Koehler. From among a half-dozen candidates the Marlins need a couple of volunteers to raise their hands — their arms — and capably join the rotation. Do you believe enough of the "ifs" might come true? February turning to March is the time for such leaps of faith, for hearts to control minds and for hope to win out. That is the beauty of baseball in springtime. THE LEGEND OF SNOWFLAKE NELSON: Heat fan and model Alyssa Nelson, a.k.a. Snowflake, got pretty excited watching the Heat beat Indiana last night, as pictured from a screengrab. Perhaps some of the fans watching Snowflake got pretty excited, too. Me? I got in a bit of trouble on the LeBatard Show today by suggesting Snowflake had invited the catcalls she was getting on social media by her choice of attire. This to me was not a mysogenist comment, but rather a practical one. If you want to jump up and down with that neckline showing that much cleavage, please do not feign surprise or disgust when you are, show we say, noticed. That's pretty much the point, is it not? ON JOEY BATS: Blue Jay slugger Jose Bautista is demanding a $150 million, five-year deal from Toronto (or someone else in free agency), and suggesting his demand is non-negotiable. Dear Joey Bats: The market will determine that. As someone who'd be 36 as a free agent, you won't sit out a year, so your bargaining power is diminished. You have been underpaid, yes. But a demand of $30 million-per seems rich for the age bracket -- even for someone who hit 40 homers last year. THANKS, JEB BUSH: Been meaning to say, since he dropped out of the presidential derby, that I thought Jeb Bush ran a decent race, relative to the negativity and divisiveness surrounding him. He simply was too moderate, maybe too decent and unwilling to get down in the mud, to survive in 2016. I can tell you, as a registered Democrat, that I found Bush and John Kasich the two Republicans for whom I might have most considered voting. Bush spoke to issues and answers while Marco Rubio begins every answer to every question with a hyperbolic, rote attack on Barack Obama or Hillary Clinton. Alas, the polls told us which tactic worked best and who was Florida's favorite son. Jeb leaves in defeat, but with his honor intact. 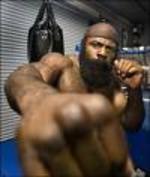 The YouTube- and media-created mystique surrounding Miami's Kimbo Slice continued to get stripped away when he got pummeled in a 14-second beating in a mixed martial arts bout at the Sunrise arena. I have marveled for a long while how Kimbo has managed to exceed his 15 minutes of fame. Thinking the clock has now run out on him. All the man had was his aura of badass invincibility. What's left? As I wrote several weeks ago, mixed martials arts in general and EliteXC in particular are brutal and barbaric and should go away. One thing, though, about the speculation making the Internet rounds the past several days regarding this fight being fixed. Do I think EliteXC is above fixing a fight or that CBS wouldn't look the other way? No. But if this fight was fixed, it was fixed very badly, because Kimbo losing probably the worst thing that could have happened to this "sport." Which alone made the evening a success. [Friday Update: My Thursday column has thus far generated well over 100 e-mails, the vast majority predictably critical of what I wrote -- predictable because the column has been posted on several MMA sites. My finger hurts from using the Delete button so much. Just kidding! Wouldn't want to imply I don't read my e-mails! I am constantly amused when sports fans become enraged when others do not share their view. I might like football, snowboarding or bocci. Doesn't mean you have to]. You'd know by my new column online now and shipping to Thursday's newspaper -- click here -- that I don't much like the mixed martial arts/ultimate fighting thing, nor do I follow lemming-like to join the mania over the "sport's" hottest current practitioner, Miami's own Kimbo Slice. As the sport and Kimbo (pictured) prepare to get their biggest shot of publicity yet with a first prime-time airing by CBS on Saturday night, it's time to weigh in. I think the sport is barbaric beyond reasonable discourse, and that those who practice it or cheer it shame themselves. I also think that Kevin Ferguson (Kimbo's real name) should be nobody's hero just because, instead of crime, his answer to poverty was the legalized criminality of beating other people with his fists. The question is: What do you think? About this extreme type of "freestyle fighting," but particularly about the would-be urban legend Mr. Slice. Vote in our poll and elaborate with a comment. Tell why you voted the way you did. Because keeping your feelings bottled up inside could lead to "issues" resulting in years of expensive therapy, whereas venting here could lead to you winning next week's Florida Lottery.